In his brilliant and distressing essay on the cruelties of English boarding school life in the 1910s, “Such, Such Were the Joys,” George Orwell devoted a few lines to the prevailing attitudes toward feeding children. A boy’s appetite was seen as “a sort of morbid growth which should be kept in check as much as possible.” At Orwell’s school, St. Cyprian’s, the food was therefore not only unappetizing but calorically insufficient; students were often told “that it is healthy to get up from a meal feeling as hungry as when you sat down.” Only a generation earlier, school meals began with “a slab of unsweetened suet pudding, which, it was frankly said, broke the boys’ appetites.” Orwell described sneaking, terrified, down to the kitchen in the middle of the night for a slice or two of stale bread to dull the hunger pains. His contemporaries at public school had it better, and worse: so long as their parents gave them pocket money to buy eggs, sausages, and sardines from street vendors, they scrounged enough food to get through the day. This spirit of tut-tut character building through patronizing if affectionate deprivation comes off as thoroughly British, but for a time the attitude spanned the Atlantic. In 1906, one American principal opposed the growing enthusiasm for a school lunch program by warning: “If you attempt to take hardship and suffering out of their lives by smoothing the pathway of life for these children, you weaken their character, and by so doing, you sin against the children themselves and, through them, against society.” Let them starve a little, went the thinking—it won’t kill them, and it’s better than getting fat on sweets. Shameful, no? So now we have swung around a full 180 degrees to the opposite extreme, at least in American school lunchrooms. 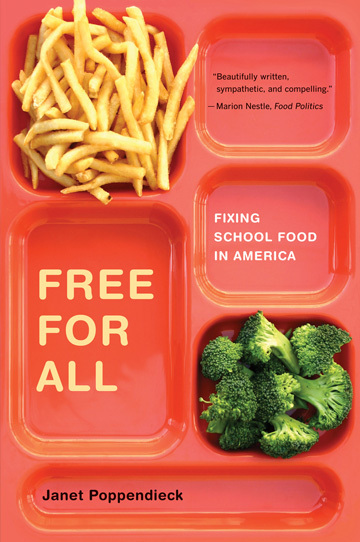 As Janet Poppendieck writes in Free for All: Fixing School Food in America, we live in “a new age in which a business model … permeate[s] school food.” Where lunchrooms in the past treated children as lucky recipients, they now view them as customers whose business must be won. Vending machines light up the hallways, usually through an exclusive contractual arrangement between school or school district and a company like Coca-Cola or Pepsi. Fast-food operations like Subway and KFC set up shop in the food court, tempting away all the students with enough money to afford a hoagie or fried chicken strips. Alongside the traditional cafeteria meal are a la carte lines where burgers and French fries (and their unholy cousins, tater tots) glisten with grease under the lamplights, exempted in all their fatty glory from USDA nutritional requirements. Even those children who buy the standard hot meal eat mostly junk: pizza with fries hits all of the major food groups, if you define the groups expansively enough. As Ronald Reagan’s USDA famously taught us, ketchup is, after all, a vegetable. If depriving schoolchildren 100 years ago grew out of the social Darwinist view that suffering and want build character, the current, equally ridiculous system owes much to poor eating habits at home, and to the philosophy that children must above all be enabled as autonomous decisionmakers from the day they take their first step. Parents these days feel an almost crippling need not to overstep—they must guide children’s choices, rather than intervene and make those choices on the children’s behalf. Poppendieck describes her consternation at seeing cafeteria workers catering to a child’s every impulsive demand, rather than, as in her day, intervening when Junior tries to substitute an extra brownie for his broccoli. With the business approach to school food come money woes, and these permeate Poppendieck’s excellent, informative, if occasionally dry book. School districts simply do not have the funds to make ends meet, and hence the drive toward vending machines and a la carte junk food lines. Under the National School Food Lunch Program, there are three tiers of school meals: free ones for the poorest children, reduced-price ones for those with somewhat greater means, and fullprice meals for everyone else. All of the meals, including the fullprice ones, are subsidized and therefore artificially cheap. And it is hard to break even when your most expensive meal costs $1.50, so school districts have increasingly turned to unregulated (and pricier) a la carte lines, the income from which goes straight back into the cafeteria program, and vending machines, which help fill out the schools’ general discretionary budgets. Sell enough Twizzlers and you might be able to afford new uniforms for the marching band. In one of Free for All’s best scenes, Poppendieck attends the School Nutrition Association’s Child Nutrition Industry Conference in Austin, Texas, to learn the latest approaches to branding and marketing one’s school food program to children. Junk food certainly sells. But beyond the obvious, branding the cafeteria with a theme is a useful approach, and then you plaster the theme everywhere. A motif like “café.com” stenciled on the trays, napkins, server hats, and ladles will apparently make the place cool enough for children to patronize; Hawaiian and Dr. Seuss themes have also succeeded. Poppendieck’s survey of the broken school lunch program is sophisticated and nuanced, and her conclusions, which tend toward healthier food and greater funding, are generally sound, with one notable exception. She is far too easy on the USDA, which administers and regulates the school lunch program on the federal level. When the National School Lunch Act was passed in 1946, Congress described it as a way “to encourage the domestic consumption of nutritious agricultural commodities.” Ever since, the school lunch program has been a captive and exclusive market for subsidized agribusiness products, like corn (and highfructose corn syrup), meat, and dairy. Our farm system is propped up by the worst type of corporate welfare to the biggest industrial producers, and foisting their artery-clogging products on schoolchildren is the inevitable result of USDA’s stewardship. As in other contexts—most notably the regulation of animal welfare in farms and slaughterhouses, which is the USDA’s charge—the agency is completely captured by industry interests and therefore incapable of enacting meaningful regulations. The USDA’s provisions restricting the sale of “foods of minimal nutritional value” in schools, for instance, define that term so loosely that a candy bar containing peanuts exceeds the threshold, escaping regulation. When the rule was enacted thirty years ago, it was rightly described by critics as “a total cave-in to the snack food industry.” Poppendieck’s resistance to the call by many reformers to transfer the school food program from the USDA to the Department of Education is therefore frustrating, and a little baffling. Another central concern of Free for All is school hunger—an ironically persistent problem in an age of plenty and excessive freedom of choice. Schools have largely failed to reduce the stigma that accompanies accepting a free lunch. In many schools, nonpaying children stand in separate lines from their classmates, and in some California schools they are the only students who eat inside in the cafeteria rather than outside in the pay-as-you-go food court, because the trays cannot be taken out of doors. Poppendieck is justifiably outraged by this insensitivity, which segregates children by income and leads some to skip meals so as to avoid cruel jibes from their wealthier friends. Her solution to the problem of stigma, which feeds the problem of hunger, is not novel but is nonetheless radical. As the book’s title suggests, she recommends free school lunches for all children. She estimates that such a universal food program would cost roughly twice today’s expenditures: from about $12 billion to about $25 billion. Whatever may recommend it, it is therefore unlikely to be enacted. Poppendieck explores many possibilities for finding the money, and frankly acknowledges that they present a tricky seesaw of progressive and regressive conundrums. Taxing soft drinks in schools, for instance, is a sensible idea, but such a tax, like all regressive taxes, would fall disproportionately on the poorest students, and therefore offers an unsatisfactory means of paying for universally free lunches that are meant to help the poor. A universal program is also regressive by its very nature because it would spread resources currently directed toward poor children to children from middle- and even upper-class families. In interviews with Poppendieck, cafeteria workers in Beverly Hills chafed at the notion that taxes on their meager incomes should provide free lunches for the BMW-driving crowd. Poppendieck too quickly writes off more practicable (and less expensive) solutions like swipe cards, which would disguise whether and how much each child pays. However problematic and politically untenable a program of universally free school lunches may be, Poppendieck is right to confront the scourge of school hunger alongside the problem of laissez-faire junk food consumption by children. In a sense, we currently occupy the two worst extremes: overweight youth living off vending machine confections coexisting with students who cannot get enough to eat because the school system is chronically broke. Orwell would be appalled.